Summer in the UK is a mix between two weeks of sun and then a week of rain, making it hard sometimes to leave the house and wonder what should I wear today? Leaving the house this morning however it’s not that often that it’s super warm and I always make sure I prepare myself just In case, should it rain, and my go-to piece at the moment is an oversized shirt. 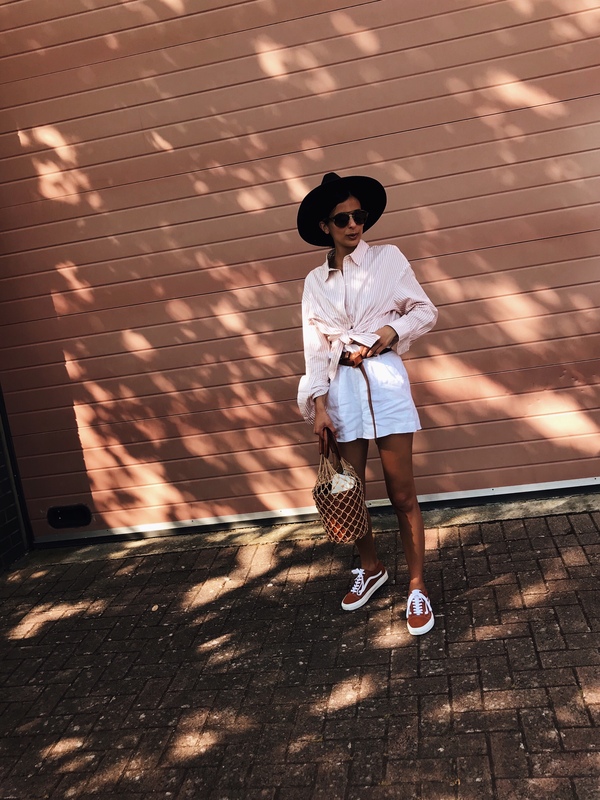 I can’t stop buying them and find that they are super versatile in that you can team them with pretty much anything from skirts to jeans and shorts like I have styled here. This oversized shirt from H&M (here) which I love is perfect to take you from a casual outing to evening. I went up a size to give the fit a boyfriend oversized kinda feel and its worked really well. I styled the top in two ways so that you guys can see just how versatile it is. For a casual off duty look, tie a knot at the front and bow it, but be sure to team it with anything high waisted only showing a little midriff to keep it classy! 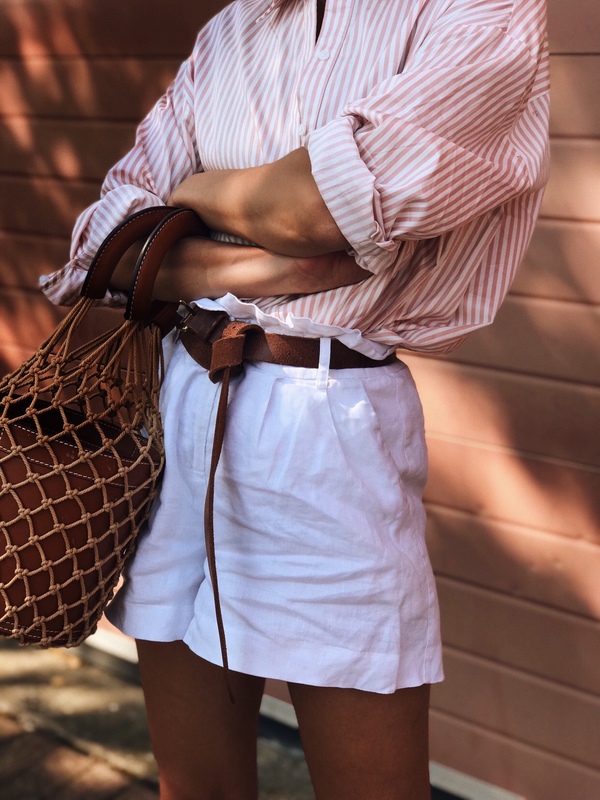 I kinda wish I saved this shirt for a cooler day but I loved the way it looks with these Reiss Paper Bag waist shorts (similar here in pink) keeping the balance and proportion right. 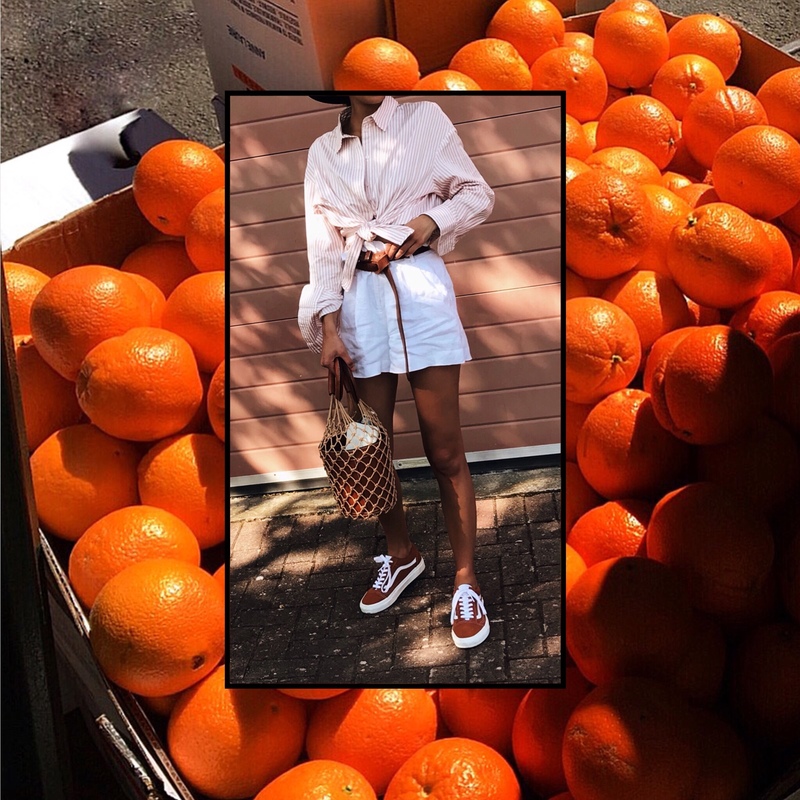 I styled it with my glazed ginger vans (here) which I wrote about here for a much more casual day look. I’m wearing my favourite SS18 Staud Bag (here and in other colours here) to give the look a summer feel. The bag is amazing! Great style! Great neutral colours combination!! I love the bag and the sneakers together. You look awesome! !